Given this disconnect, it is particularly troubling that MEGA's program has become increasingly vague, incomplete and difficult to obtain. Not drawing attention to the program's actual results may be questionable, but there is no reason to make the results hard to ascertain. The need for greater transparency in government programs has been widely recognized. President Barack Obama as a U.S. senator co-authored a law to place more federal spending data online. The Michigan Education Association, the state's largest school employee union, has called for better reports on the results of Michigan's economic development programs. [*] The Mackinac Center for Public Policy, publisher of this study, has initiated a "Show Michigan the Money" project that has encouraged scores of the state's municipalities, elected officials and local school districts to place their check registers online. 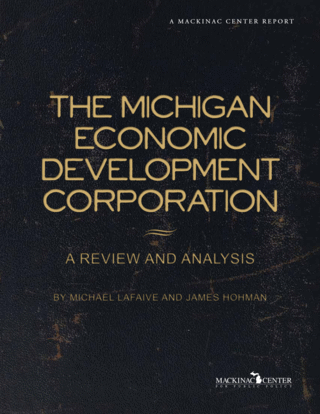 The trend toward transparent government appears to have been reversed, however, in the case of the Michigan Economic Growth Authority. In MEGA's early years, the program produced reasonably detailed data on the businesses it selected, the jobs created, the incentives provided and so on. In the past few years, this data has become increasingly vague and difficult to obtain. A similar loss of transparency appears to be occurring with the MEDC. Despite its quasi-private status, the MEDC is subject to government reporting requirements and the Freedom of Information Act. Still, it has become less forthcoming with information about the agency itself and about the high-profile Michigan Film Incentive subsidy, another economic development program under its supervision.